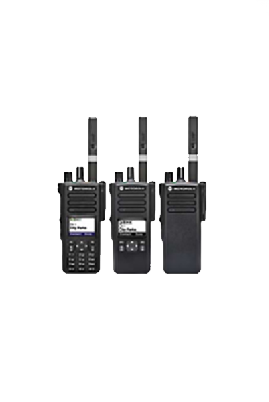 Our DP4000 Series radios offer a smart feature in digital mode –Intelligent Audio. With Intelligent Audio, the radio volume automatically adjusts to compensate for background noise so workers don’t have to adjust their radio volume to avoid missing a call in loud situations or disturbing others when they move into quiet places. Increased background noise suppression filters out unwanted external clamor – from road traffic to the roar of engines. Your workforce can also enjoy the benefits of Intelligent Audio with select audio accessories. Plug in an IMPRES accessory and it instantly sets the volume level and enhances the Intelligent Audio capabilities on the radio. With IMPRES, your radio not only recognizes the accessory and loads the correct profile to optimize audio performance, but combined with Intelligent Audio it intuitively adjusts volume to compensate for background noise. Improve the mobility of your crews without wires getting tangled. We’ve embedded Bluetooth in to your DP4000 Series radio so no adaptor is needed. Indoors at the plant or outdoors at the gate, our exclusive Operations Critical Wireless earpieces handle loud environments while an optional wireless push-to-talk (PTT) button seamlessly links to any earpiece. Just put the PTT in a pocket or on a lapel and connect instantly. The DP4000 Series radios have a new wide band UHF whip antenna that provides coverage across the entire band (403-527 MHz). Choose stubby antennas when you want an unobtrusive option. These stubby antennas offer even better performance than previous Motorola stubby antennas.